We are providing professional painting service in Kathmandu, Bhaktapur and Lalitpur areas. We are using the latest technologies and types of equipment for our painting service. While we paint outside or exterior part of the wall we using rope access technologies. It is easy to agree that painting your home, office or building makes space look cleaner and good looking. However, there are main reasons apart from aesthetics why you need to paint your walls. The walls act as a filter to collect dust and dirt if they are left without any paint. So it is important to clean the walls and apply a nice paint. However, painting the entire building or even a room is a big hassle and can't be done without the hands of a professional. 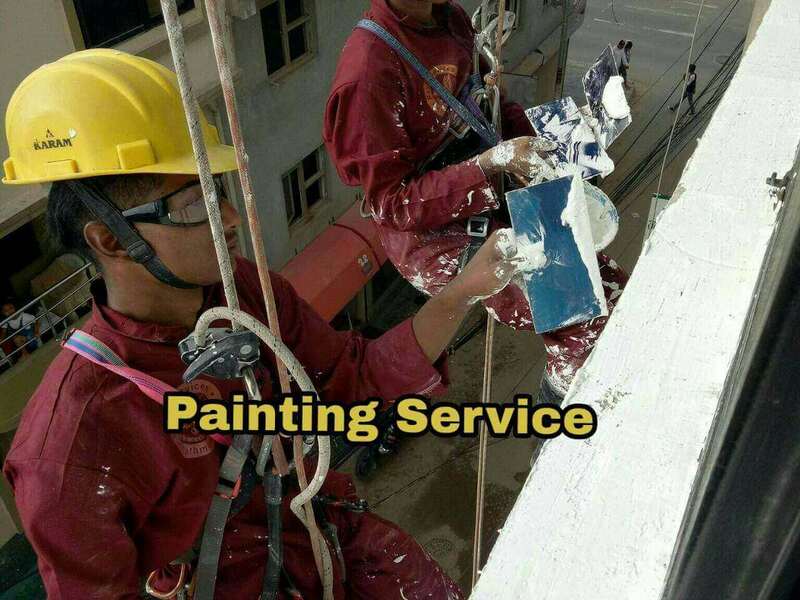 Royal cleaning services offer the best painting services inside Kathmandu Valley to keep your interior and exterior walls looking flawless. We offer a very basic kind of house painting. Our team of house painters will change the look of your home in just a few days. The painting service is entirely tailored to your need. You can either ask to paint a few rooms or the entire interior and exterior walls of the house. This is the easiest way to give your house a vibrant new look. Our house painters are experts in this field so the light also suggests some color patterns if you are confused. Apart from painting your walls, we also offer painting your doors and the rim of your windows. We not just provide painting services as a remodeling agenda for houses but also for these building which have just been constructed. With access to a vast pool of excellent craftsmen and state-of-the-art equipment, we provide painting services to new constructions. The deadline and the price of the service are decided after negotiation. We ensure through past experiences and feedbacks that the service we deliver is excellent, cost and time effective. If you are looking for enhancing the overall value of your business may it be a hotel, restaurant, condominiums, conference rooms, buildings etc., we offer commercial painting services. We have previously worked with various businesses and have also received excellent feedback from our clients. Our expert team makes sure that we cater the service to your need. We are also flexible in time, so we provide services as per your deadlines. We ensure that the interiors and exteriors of your business buildings get painted with perfection. Why Royal Cleaning Services for Painting service? We not just provide cleaning services but also are experts in painting inside Kathmandu Vallley. We use the latest technology for ease and safety as well as standard in painting. We use strong ropes for painting on the walls for offices and homes for the safety and security of our painters. We also use modern brushes for quicker as well as standard painting. We use harnesses and helmets for the protection and security of the painters. Painting enhances the value of your building since it is the best way to remodel without the high cost. The immediate value is added to your home after painting. You can simply ask us to paint your building and give it a new look in the most economical way. Our excellent painting service refreshes our home with a dash of vibrancy and lively environment. Most people also experience positive energy and improved outlook after simply changing the color of the interior and exterior walls. The excellent painting service of Royal Cleaning Service protects the air quality. Using zero VOC or low VOC paint with excellent finish can reduce fumes and odors. It promotes healthy indoor air quality. Plastered walls alone will not help to minimize outside dust and dirt to enter the building. It is vital that you paint the walls to get rid of dust and dirt from sticking to the walls. The exterior walls, in particular, will keep dust at bay. Royal Cleaning services not just paint your walls but also makes sure that the permanent marks and stains left behind are all covered up. Usually, households with children have stains and markings in the wall. We cover up the markings and stains seamlessly with our standard technique. The main reason why you need a professional paint expert like ours is that we can tell you approximately how much paint will be used, what tools are best used for painting, the paint that should be used to protect the walls, and more. We provide these kinds of suggestion and advice through our professional experience which ultimately helps you to reduce costs and wastes. Our painters not just assure that your walls are painted in a set standard and with perfection, but also provide you details on the kind of color that would best suit the rooms. When you are choosing a painting service like Royal Cleaning services inside Kathmandu Valley, you are wisely choosing your way towards a brand new interior that will leave your guests astonished!